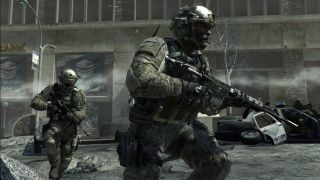 Call of Duty 2019 will have a campaign, multiplayer, and co-op "rooted in some of the franchise’s most important history"
This year's annual instalment in the Call of Duty game will bring back a singleplayer campaign, feature a "huge and expansive multiplayer world", and include some form of co-op gameplay, according to Activision, who will be publishing Infinity Ward's upcoming iteration in the massively popular first-person shooter series. This news was announced during Activision's quarterly earnings call with shareholders, press, and the general public on February 13 this week, in which CFO and President of Emerging Businesses Dennis Durkin described 2019's Call of Duty as "another major launch for the franchise that will appeal broadly to both existing and new fans with what I can only describe now as a great step forward in the franchise that is also rooted in some of the franchise’s most important history." The part about being rooted in the franchise's history corroborates with the new Call of Duty rumours and teases we've already had from developer Infinity Ward, who appear to be gearing up for a sequel to its critically acclaimed Call of Duty: Modern Warfare series. We've already had confirmation that the studio isn't working on a follow up to either Call of Duty: Ghosts or Call of Duty: Infinite Warfare, which again corroborates with this ongoing theory. Activision CEO Bobby Kotick also stated in the earnings call that the team "haven’t seen this much enthusiasm [about this year's Call of Duty] that I can remember almost ever. So, we’re excited about the fall release of Call of Duty content." Those are big promises for a franchise that tends to stick to what it knows, but it won't be long before we find out more about what Infinity Ward have been up to over the last three years. We may not know what the next Call of Duty looks like just yet, but here's the best new games of 2019 that are officially scheduled for this year.